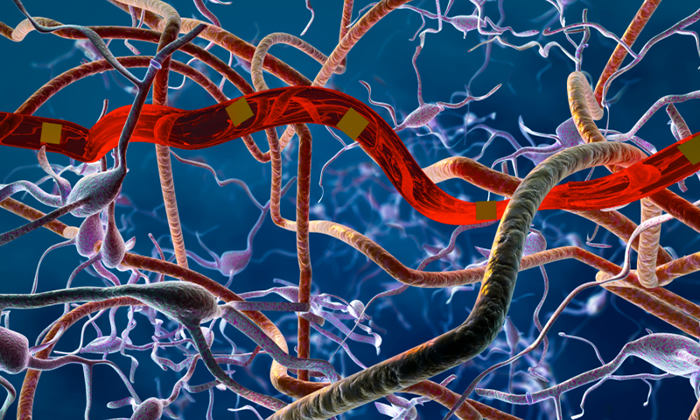 At The University of Texas at Austin, engineering researchers have designed ultra-flexible, nanoelectronic thread (NET) brain probes that can achieve more reliable long-term neural recording than existing probes and don’t elicit scar formation when implanted. The researchers described their findings in a research article published on February 15th in Science Advances. In contrast, the UT Austin team’s electrodes are flexible enough that they comply with the microscale movements of tissue and still stay in place. The probe’s size also drastically reduces the tissue displacement, so the brain interface is more stable, and the readings are more reliable for longer periods of time. To the researchers’ knowledge, the UT Austin probe—which is as small as 10 microns at a thickness below 1 micron, and has a cross-section that is only a fraction of that of a neuron or blood capillary—is the smallest among all neural probes. “The most surprising part of our work is that the living brain tissue, the biological system, really doesn’t mind having an artificial device around for months,” Luan said. The researchers also used advanced imaging techniques in collaboration with biomedical engineering professor Andrew Dunn and neuroscientists Raymond Chitwood and Jenni Siegel from the Institute for Neuroscience at UT Austin to confirm that the NET enabled neural interface did not degrade in the mouse model for over four months of experiments. The researchers plan to continue testing their probes in animal models and hope to eventually engage in clinical testing. The research received funding from the UT BRAIN seed grant program, the Department of Defense and National Institutes of Health. What came first- the decision or the movement?